Join a fun and supportive women’s group, with THREE coaches, in an 8 Week Program to motivate and challenge you to feel unshakably confident, enjoy vibrant energy and strength and look your best for New Years. Ladies Group! … To connect with your inner beauty in a deeper, emotional way. … To drive away every self-limiting belief and insecurity in a consistent and confident way. … To turn goals and dreams into the reality you live every day. … To make your hard work and discipline actually pay off. … To rock that little black dress in a meaningful and utterly unmistakable way. But, all too often, smart and beautiful women (like you) follow myths, complex plans, and extreme workouts that just don’t give us what we really need. (Don’t worry, it’s not your fault). 8 Weeks of Fun Begins in a Private Facebook Group & Other Tips to Rock Your Little Black Dress On NYE! 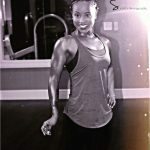 For 7 years as a Fitness Professional, Sponsored Athlete (Optimum Nutrition, Suits by Amy and Muscle Club Apparel) I’ve transformed women, helping them to be the Lady Leader of their life, by improving confidence, establishing lifestyle routines and giving them the actionable tools to build the mind, body and life of their dreams. Coach Denea James is the Founder of DJ Fitness, an ISSA Certified Fitness Trainer, Nutrition Specialist and ACE Group Fitness Instructor who’s been helping women for 3 years. She quickly realized this was more than workout and scheduled eating, it was about a holistic lifestyle. Her passion lies in helping women find the best in themselves by integrating faith and fitness. Coach Sarah Hunt is an NASM Certified Personal Trainer, Integrative Nutrition Holistic Health & Nutrition Coach and doTerra Wellness Consultant. She holds Master’s Degree in Education Administration from Xavier University and loves how her passion for teaching fits right into the fitness industry. Now with 6 years of experience her passion still lies in helping women exceed their personal goals and learn a balanced life they love. If determined women use The Little Black Dress Project Women’s Group Program, they will overcome the lack of motivation, fatigue, and dreaded holiday weight gain and finally rock a little black dress with a look and feeling of confidence. So let’s get it right. Together.